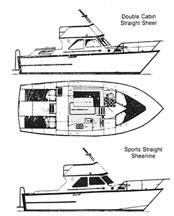 This practical cruiser design allows you to build either a sports or double cabin cruiser with choice of sheerlines. They are: (a) a double cabin version, which sleeps up to 6 from 4 single berths with dinette convertible to double bed. (b) sports convertible with aft, self draining cockpit and sleeping for 4 from 2 vee berths for'ard and dinette convertible. Toilet with shower and basin and U shaped galley is common to both versions. There is good stowage and cupboard space. Headroom throughout is 6 ft. 4 in. Only approx. 2.7 tons steel required. Specifications include 90 x 6 flat bar frames with either 3 or 4 mm shell plating. Construction has been kept to simple hard chine, especially for amateurs who can weld, cut and work steel. Estimated building time is 400 amateur hours for all the steelwork. The drawings are in metric. Plans are extremely well detailed in large scale and comprise 12 sheets, including: general arrangement, lines, steel hull structure details, stern gear and shafting engineering, piping, electrical, joiner etc. Plans & Patterns Only $99, Was $295.